Janmot was born in Lyon, France of Catholic parents who were deeply religious. He was extremely moved by the death of his brother in 1823 and his sisters in 1829. He became a student at the Royal College of Lyon where he met Frederic Ozanam and other followers of his philosophy professor, Abbe Noirot. In 1831 he was admitted to the École des Beaux-Arts de Lyon and a year later, he won the highest honor, the Golden Laurel. In 1833, he came to Paris to take painting lessons from Victor Orsel and Jean-Auguste-Dominique Ingres. With other Lyon painters, he entered the Society of St. Vincent de Paul. 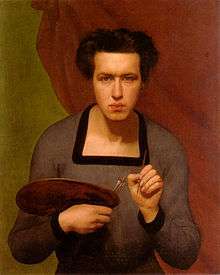 In 1835, he went to Rome with Claudius Lavergne, Jean-Baptiste Frenet and other students and met Hippolyte Flandrin. Wikimedia Commons has media related to Louis Janmot. 1 2 Turner, 2000, p. 258. Rouf, Gabriella (2012). "L'opera di una vita. Louis Janmot e Il poema dell'anima." (PDF). Il Covile. Retrieved 22 February 2013.